Alberoni is a small village in the south of the island of Lido near Venice. With almost 1,000 inhabitants it is the third largest settlement on the island. Alberoni is a tip for holidaymakers who are looking for a quiet place around Venice and want to be quickly with public transport in the old town of Venice at the world famous sights. In and around Alberoni in the south of the island there is relatively little tourism. Many cyclists cross the village. Cycling tours through Lido and the neighbouring island of Pellestrina are very popular with tourists. Alberoni does not have many places of interest to offer (see: article about places of interest on Lido). There is one of the most beautiful golf courses in Italy nearby. The village also has good bus and ferry connections to Lido. Alberoni also has a nature reserve for small walks, woods (especially pine trees) and some beaches. The beaches with large dunes are little visited and partly natural. 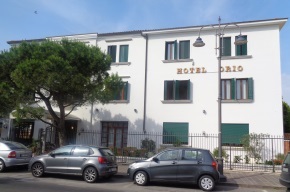 There are guided tours through the nature and through the dunes..
A good accommodation is the Hotel Villa Orio central in Alberoni. Here you will find nice rooms with air conditioning, WLAN, breakfast and much more. Rooms at Villa Orio Alberoni can be booked on this page (Booking.com). There you will also find more information about the accommodation. The village is in the south of Lido, the neighboring island of Pellestrina in not far away. Better bus connections are hardly imaginable. About every 10 minutes there is a bus line A from Alberoni via Malamocco to the city of Lido. The bus line ends directly at the ferry port to Venice. Of course, the buses also often go in the other direction. Beside the frequent line A there are still further lines to the big ferry port of the island Lido named "Santa Maria Elisabetta". From this ferry terminal there is a ferry to Venice every few minutes. The majority stops in the tourist centre of San Marco. Quite a few go on to the bus station at Piazzale Roma and Venice main train station. 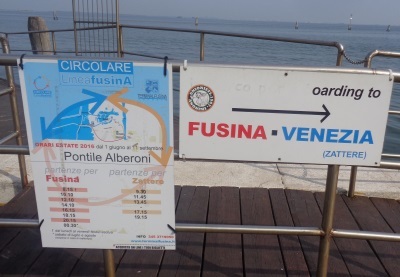 Both the buses from Alberoni to Lido City and the ferries to San Marco take about 15 to 20 minutes each. Thus, one is about 3/4 hours after leaving Alberoni by bus, already at the central St. Mark's Church in Venice. Tickets for all buses are available in the tobacco shop, not in the bus (fare 1.50 Euro in spring). To Venice by ferry, it is better to buy a time ticket (day ticket, week ticket, etc. ): more information on this page. The A line buses go south to the ferry terminal for the ferries to the neighbouring island of Pellestrina. From Alberoni it is even better to take the bus line 11, which goes directly to the ferry and then crosses large parts of the island of Pellestrina. From Pellestrina you can take another ferry to the mainland to the city of Chioggia in the southern lagoon of Venice. Both mentioned ferries leave at least once per hour during the day. The timetables of the buses and ferries are coordinated. More information and tickets also in the tobacco shop in Alberoni (directly in the center). In summer there are about 6 times a day bigger car ferries from the centre of the village Alberoni to Fusina. The port of Fusina is a few kilometres south of Mestre on the mainland. In the year 2019 the ships will operate from 1st June to 10th September. To the south of Alberoni is the only golf club in Venice that we know of. It is a very beautiful course, for many connoisseurs it is one of the most beautiful golf courses in Italy. 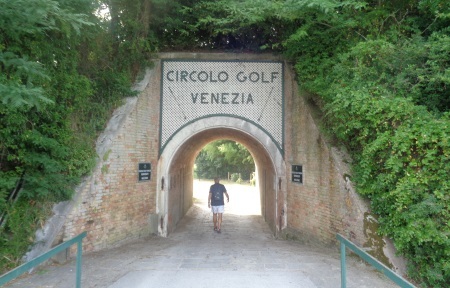 The "Circolo Golf Venezia" in Alberoni is a large 18-hole golf course with a long history (opened in 1928). You can also play a round of golf as a guest. You can rent clubs and electric trolleys. 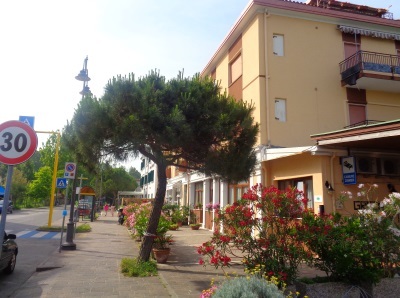 The golf club is easily reached by bus (1-2 bus stops south of Alberoni, journey time less than 5 minutes or on foot less than 1 km from the town centre). Another golf club near Venice is Lido di Jesolo.